The Upper Hudson Library System (UHLS) is a cooperative association of twenty-nine autonomous public libraries working together to improve library service for the residents of Albany and Rensselaer Counties. UHLS is one of twenty-three public library systems in New York State. 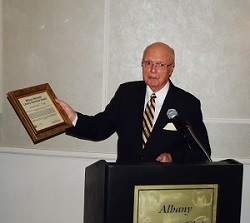 UHLS honored recently retired NYS Senator Hugh T. Farley, presenting him with the UHLS William Meredith Library Advocate Award. The full award citation is here. Every UHLS library is a hotspot this spring. Check out our shared program calendar to find special events! Last updated: 4/18/2019© Upper Hudson Library System. All rights reserved.